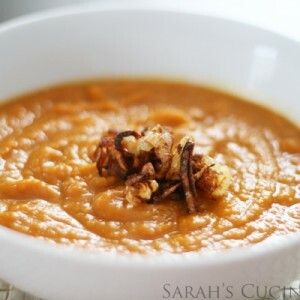 This quick and easy recipe for Butternut Squash Soup can be topped with crispy shallots for a comforting fall and winter meal. Comfort food brings us to that warm, happy, good place, the one where we feel safe and warm and loved. It’s food that reminds us of happy times, or just warms us on a cold, wet winter day. Today definitely falls into that cold, wet winter day category. Although late last night my weather source was predicting maybe two inches of snow, we woke up today to no school and six inches of heavy snow outside. And it’s been raining. That makes this day perfect for a warm, comforting soup like this one. I love pureed soups like Potato Leek Soup and this one, especially when the weather is like this. They are easy and filling and taste so good. 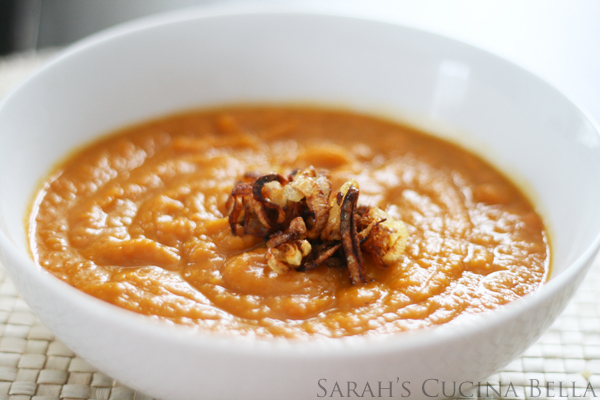 This Butternut Squash Soup begins with sweet onions, sauteed in olive oil until they soften. Carrots, butternut squash and an apple are added to the pot, creating a sweet-savory soup that’s thick without requiring thickeners. All of it is boiled in vegetable broth (I prefer Unsalted Kitchen Basics Vegetable Broth, which has a great flavor that’s more onion-y). Once you’ve seasoned the soup, it’s pureed into perfection. The resulting soup has notes of pumpkin pie though it’s decidedly more savory than pie. The sweetness is subtle — a hint. Served with salty crispy shallots on top, it’s just divine. The combination of the shallots and the soup really make it special. This Butternut Squash Soup is perfect for serving up on a cool day with warm biscuits and creamy butter. And the kids? They loved it too. As Will said, it’s a win-na! Optional: Garnish with crispy shallots. To make: Heat 1 tbsp olive oil in a small skillet. 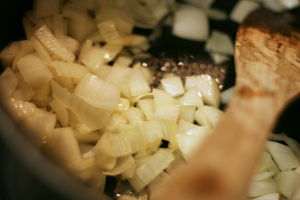 Slice shallots into thin rounds (use about one shallot/person). Saute the shallots in the oil, salting with sea salt, until browned. Transfer to a paper towel-lined plate and let sit for a minute or two. Then spoon onto each bowl of soup. Hey! One more thing. I have an exciting new writing job. 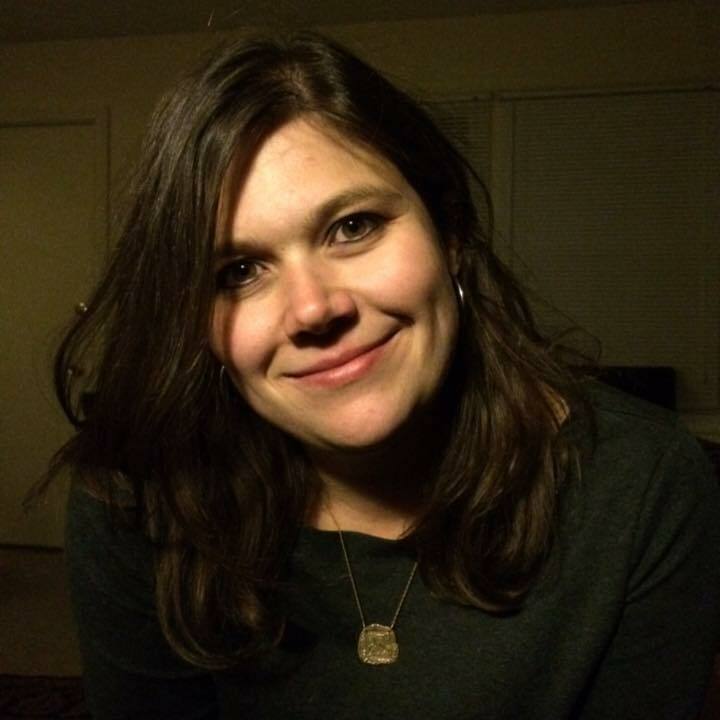 I am blogging thrice weekly for Tablespoon, a food/recipe sharing site owned by General Mills. Check out my first post over there, Chicken Dinner. Please head over there and check it out! OMG Paige doesn’t look like a baby anymore, she looks like a real little girl! And so beautiful!! This soup is right up my alley. I love butternut squash soup – along with any soup that tastes creamy but is really “not that bad” for you. 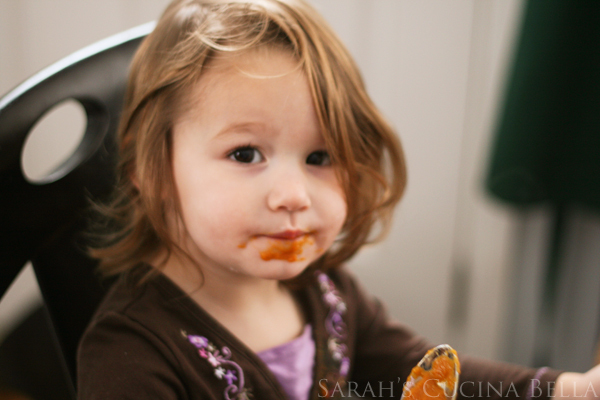 In two posts you hit on two of my favorites (sweet potatoes and butternut squash). I haven’t often done butternut squash soup since I tend to find it too sweet, but I’d like to play around with it – and I can start by using your recipe as a base. Its the right time of year to get a good recipe under the belt, as the butternut squash is overflowing!